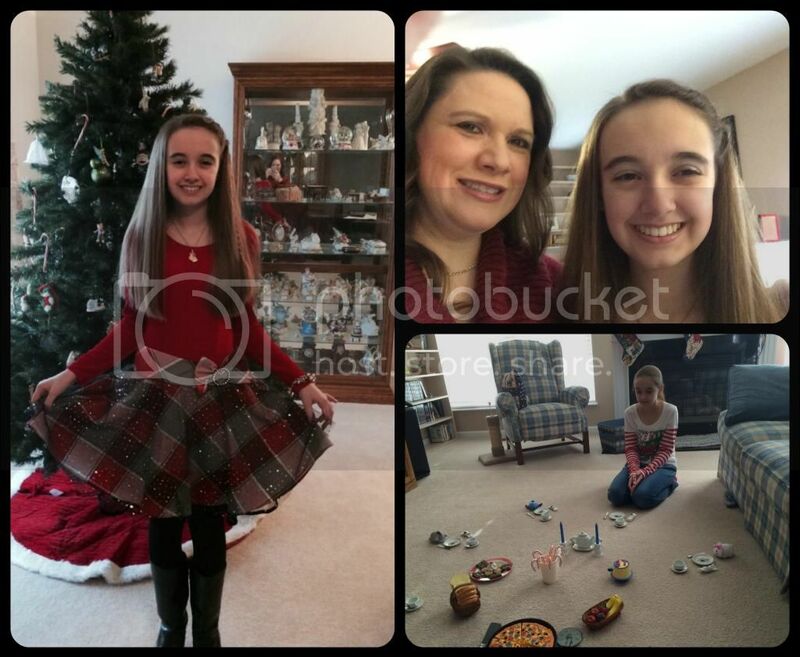 Christmas was quite a bit different for us this year because of Amber. She changed our lives when she was born (even that Christmas a couple of weeks before her birth) and she has changed it now with the dysautonomia and unnamed autoimmune disease. We are no longer able to pack as much activity and family fun into the holidays. Amber doesn't rebound from it and spends a lot of time exhausted after small gatherings. Thankfully, we are learning how to (not) manage her condition at the holiday time. I honestly spent most of Christmas time this year worrying about how Amber would do, how to minimize her exhaustion and tachycardia episodes, how to keep her intestines running, and oh.. did I forget a present? Christmas Eve - Ready for church. And little fun playing Christmas picnic with the stuffed animals. This year Amber stayed for the entire Christmas Eve church service! Last year she managed one fourth of the service before nearly passing out in the pew. She and I hung out in the ice cold bathroom for another fourth of the service before I texted Fred to just go get the car. This year it was a different, smaller church that was not quite as crowded and we knew more of what to expect. At this time in 2013 we had no clue there was anything going on past the fructose malabsorption. We let Amber sleep late Christmas morning, but first thing after medicine she was downstairs discovering her Santa gift. Even before breakfast and getting dressed her heart was doing crazy stuff on Christmas. 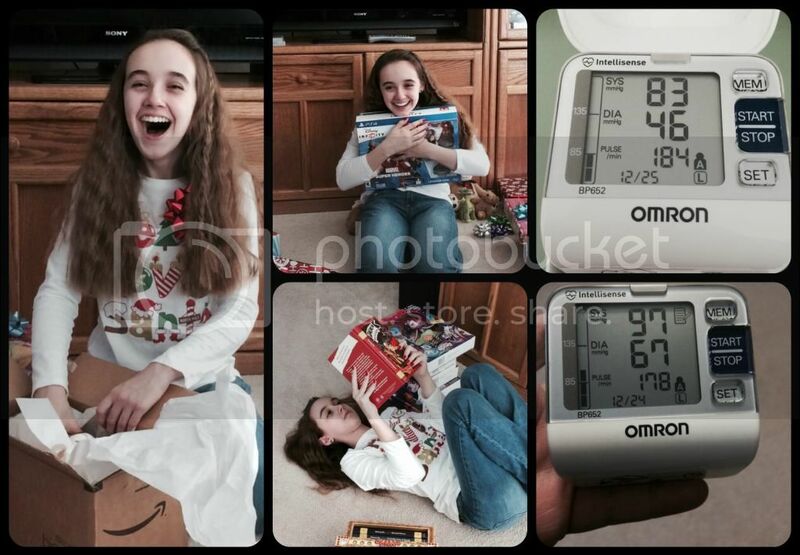 By the time we had opened our immediate family gifts Amber was wiped out. She just laid on the floor between her presents with her feet pulled up to help blood return. Christmas day excitement (a stuffed bear and the Infinity 2.0), then resting between her presents. Neither of those blood pressure / heart rate readings are good. They were both resting rates too. After a rest we made our way to my mom's house for Christmas with my family. It was a fun but long day for Amber. She loves playing with her little cousins yet that didn't alleviate the need for many rest breaks. Amber used up all her spoons plus some on Christmas day. We had planned for the 26th to be a rest and sick day for Amber. We were accurate in our planning. On Friday, Amber didn't shower and didn't even hardly move all day. I cleaned the house for our weekend visitors and Amber just played with her new presents from the couch or her bed. Fred's parents arrived on Saturday for a couple of days and Amber was still wiped out. We had hoped Friday would be enough of a break, but it wasn't. Next year we know she needs at least two days after Christmas to recover. Thankfully, Fred's parents stayed at a nearby hotel, so it wasn't quite as stressful on Amber. We celebrated Christmas with Fred's parents on Saturday and Amber's upcoming birthday (a couple weeks early) on Sunday. (Top-left and bottom-center) Christmas day with cousins. (Bottom-left) Driving her new snap circuit rover. (Top-center) Wrapped in a new MLP fleece blanket playing with a new MLP set. (Bottom-right) MLP Life. 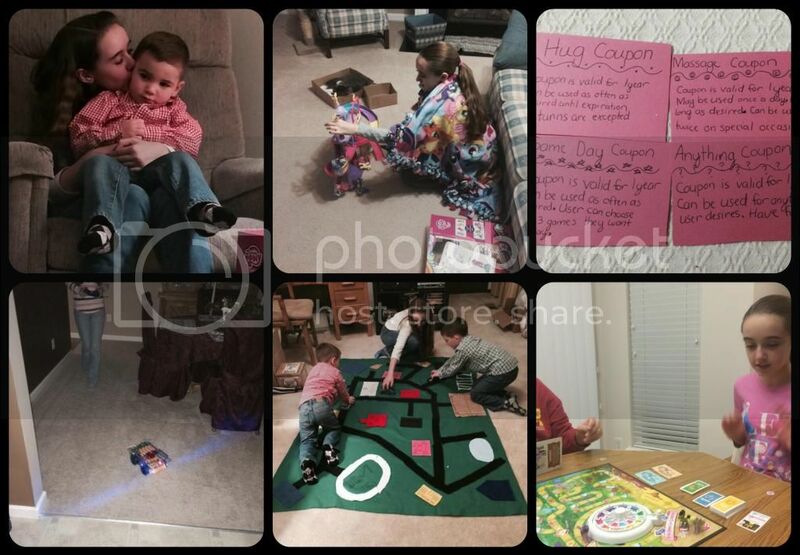 (Top-Right) My homemade gift from Amber: coupons for Hugs, Play days, Massage and Anything. Even though she feels awful she still wants me to feel better too. She's a sweetie. This week we've been hanging around close to home and trying to keep it low key for Amber. I'm so thankful for all that she has been able to do this December and that she has the time to rebound. As other kids in our area are winding up their Christmas breaks and preparing to return to school on Monday, we have decided to take more time off of school. Amber just hasn't recovered enough and starting school seems fruitless, especially with her upcoming birthday. Our current plan is to wait for any kind of school until after Amber's birthday and then see how she is feeling. My goal is to be back to full school days by the end of January while minimizing the outside activities. Wish us luck!